For years, Taprite has been a trusted name in the beverage industry. Known for their high quality, Taprite provides an array of wonderful dispensing equipment. Now, Great Fermentations is proud to bring you Taprite brand nitrogen regulators. These dual guage regulators have a male thread and mount to high-pressure nitrogen tanks with a CGA-580 valve. One guage shows output pressure and reads from 0 to 60 PSI, while the other shows remaining pressure. Output pressure is adjustable, and can be read on the output guage. 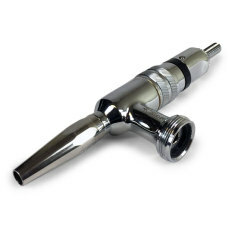 The regulator features a 3/8" O.D. barb with a shutoff valve to connect to your gas system, as well as a non-adjustable safety blow-off set for 55-65 PSI. 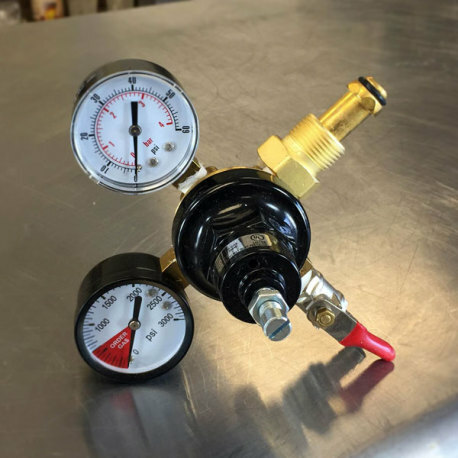 With this regulator, you will be nitrogenating and serving beautiful beer with the tell-tale cascade of nitrogen bubbles in no time!